MILL VALLEY, Calif. (March 26, 2019) — With global attention on the gender pay gap over the past three years, has progress been made to close the gap? 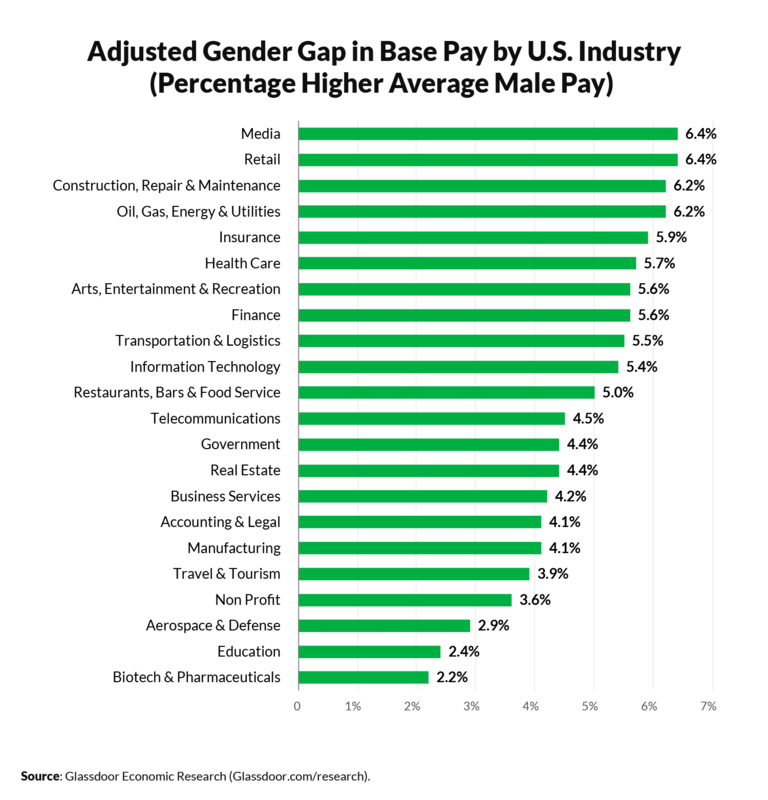 Today, Glassdoor Economic Research published a new multi-country study on the state of the gender pay gap in the United States, United Kingdom, France, Germany and four other countries. 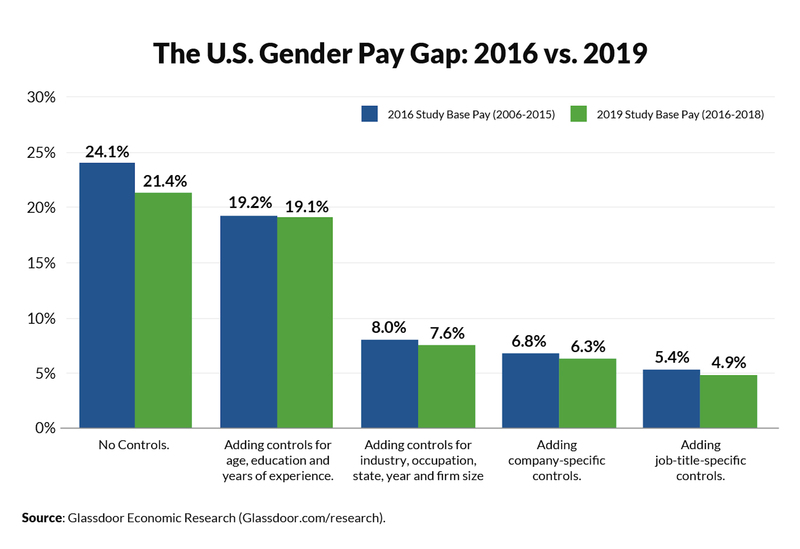 The report, Progress on the Gender Pay Gap: 2019, reveals that although significant pay gaps remain between men and women, the pay gap has narrowed slightly in the U.S., UK, France and Australia, showing improvement since Glassdoor’s 2016 study. The 2019 study, which offers new gender pay gap data on Canada, the Netherlands and Singapore, is based on more than half a million salary reports shared on Glassdoor by employees over the past three years(1), and includes pay data down to specific job title and industry. 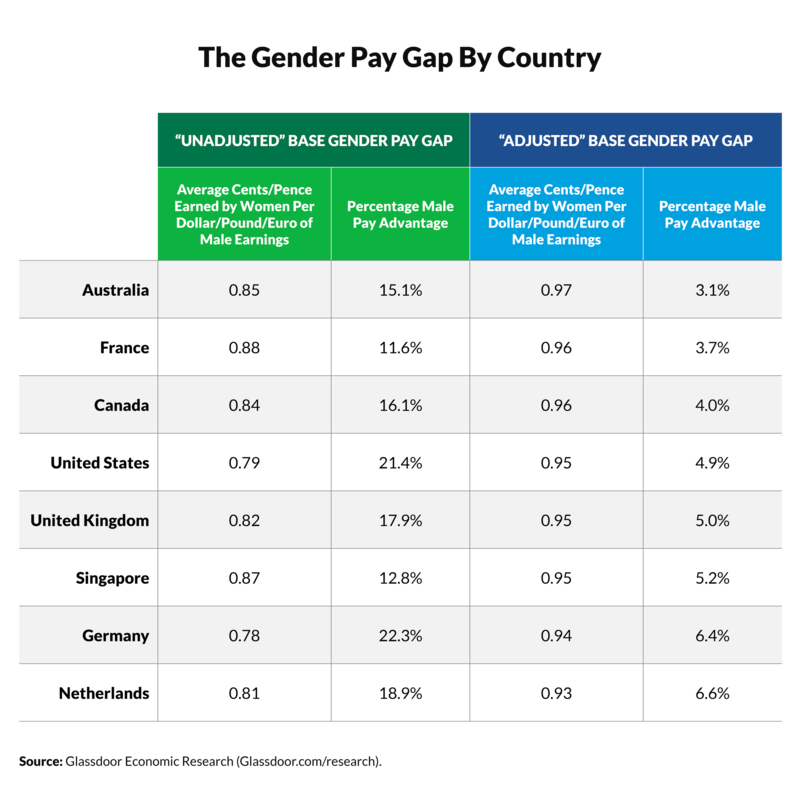 This specificity enabled Glassdoor to understand both the “unadjusted” and “adjusted” pay gap in each country. The unadjusted pay gap explains the overall difference between pay for men and women, while applying statistical controls for a more apples-to-apples comparison is known as the adjusted pay gap. Today, the unadjusted pay gap between men and women in the U.S. is 21.4 percent, meaning women earn, on average, $0.79 for every $1.00 men earn. This represents a 2.7 percentage point shrink in the unadjusted pay gap from three years ago, when women earned, on average, $0.76 for every $1.00 men earn. When statistical controls are applied for worker and job characteristics, including worker age, education, years of experience, occupation, industry, location, year, company and job title, the pay gap in the U.S. today is 4.9 percent, revealing the adjusted pay gap. This is down one half of one percentage point from the 2016 adjusted pay gap (5.4 percent). The 2019 study finds similar differences between the unadjusted and adjusted pay gaps in each country analyzed. At this current pace, Glassdoor economists estimate pay equality could be achieved in the U.S. by 2070, if all current factors remain unchanged. The pay gap can be divided into what can be “explained” due to differences in worker characteristics (e.g., age, education, etc.) and what remains “unexplained.” Glassdoor researchers found that the majority (64 percent) of the overall U.S. pay gap can be explained, while 36 percent of the overall pay gap cannot be explained by any factors observable in Glassdoor data. This means the unexplained pay gap could be attributed to factors such as workplace bias (whether intentional or not), negotiation gaps between men and women and/or other unobserved worker characteristics. One of the most significant factors contributing to the pay gap is the industry and jobs that men and women sort themselves into, also known as “occupational sorting.” This factor explains about 56.5 percent of the overall U.S. pay gap. In the U.S., the adjusted gender pay gap is the largest for pilots (26.6 percent), chefs (24.6 percent) and C-suite professionals (e.g., chief executive officer, chief financial officer; 24.0 percent). Occupations with the largest reversed pay gap, where women earn more than men, include merchandiser (-7.8 percent) and research assistant (-5.9 percent), among others. Among jobs with the biggest pay gaps, computer programmer saw the biggest pay gap improvement (16.7 percentage point shrink), down from 28.3 percent in 2016 to 11.6 percent in 2019. In the U.S., two industries tie for the widest gender pay gaps — retail and media (6.4 percent), followed by construction, repair & maintenance (6.2 percent) and oil, gas, energy & utilities (6.2 percent). The pay gap is smallest in the biotech and pharmaceuticals industry (2.2 percent) and education (2.4 percent). In the U.S. technology industry, the gap improved slightly (5.4 percent), shrinking 0.5 percentage points since Glassdoor’s 2016 study (5.9 percent). In terms of workers’ age, the study reveals the gender pay gap grows as workers get older, consistent with 2016 findings. In the U.S., workers aged 18 to 24 years face a below-average adjusted gender pay gap of 1.4 percent. By contrast, among older workers aged 55 to 64 years, the adjusted gender pay gap is 12.3 percent, more than double the national average of 4.9 percent. The gender pay gap among younger workers aged 18 to 24 (1.4 percent) and 25 to 34 (2.8 percent) saw pay gap improvements (by 0.8 and 0.5 percentage points, respectively), while the pay gap for workers aged 45 to 54 (10.3 percent) and 55 to 64 (12.3 percent) grew (by 0.8 and 1.8 percentage points, respectively). Does a ‘Salary Confidence Gap’ Contribute to the Gender Pay Gap? The confidence gap, which refers to the concept of how men and women differ as it relates to self-confidence and belief in their own abilities, is a complex issue that Glassdoor researchers explored surrounding the gender pay gap(2). Glassdoor economists looked specifically at the ‘salary confidence gap’, and studied the question: Does a ‘salary confidence gap’ exist when applying to jobs, and if so, does it contribute to the gender pay gap? To answer this question, researchers leveraged job application data, derived from open job listings with salary estimates on Glassdoor, and compared how men and women, including similarly qualified men and women, applied to open jobs that include pay ranges. Economists found that while men apply to higher paying jobs than women overall, similarly qualified men and women applied to jobs with roughly the same pay. The study shows that men applied to jobs with base salaries that are, on average, $13,635 higher, or a gap of 18.3 percent, mostly due to the same occupational sorting differences that were also found to be a leading contributor to the overall gender pay gap. However, when comparing job application data by similarly qualified men and women, the adjusted ‘salary expectation gap’ drops to less than one percent, showing virtually no difference between men and women’s salary expectations when applying to jobs. The study concluded, based on these findings, that the concept of a ‘salary confidence gap’ is unlikely a significant driver of the gender pay gap. It also notes that the data shows pay transparency during the job search process can help employees find opportunities more closely aligned with their current market value. The 2019 Glassdoor study also reveals the unadjusted and adjusted pay gaps, and how they’ve changed since 2016, in the United Kingdom, France, Germany and Australia, along with new pay gap data in Canada, the Netherlands and Singapore. Findings in each of these markets are similar: a larger unadjusted pay gap that shrinks, but does not disappear, when additional factors such as worker experience, age, location and job title are considered. Similar to the U.S., pay gaps have slightly improved over the past three years in the UK and Australia, but not in Germany. Of the eight countries in the 2019 study, Germany has the largest unadjusted pay gap (22.3 percent), while France has the smallest unadjusted pay gap (11.6 percent). For Job Seekers and Employees: Visit Glassdoor to, submit a salary report, research salaries and see if you are being paid fairly by receiving your current salary estimate using Glassdoor’s salary calculator tool. 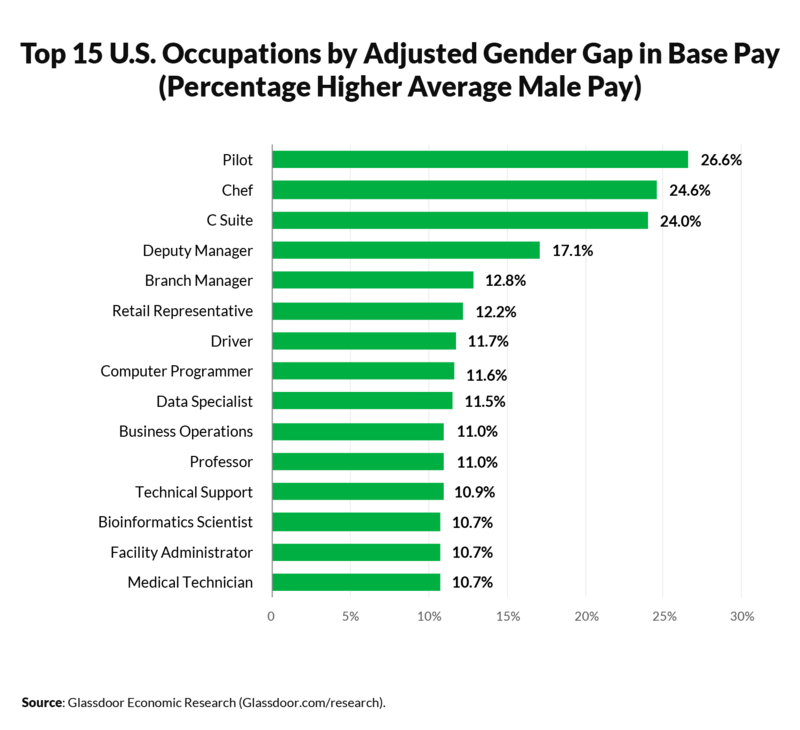 For a comprehensive look at the study and more information about how to close the gender pay gap, visit www.glassdoor.com/equalpay. For Employers: Use Glassdoor’s free pay audit tool to analyze compensation at your company to determine if pay gaps exist. If equal pay is a priority for your organization, join more than 5,800 other companies that have taken Glassdoor’s Equal Pay Pledge to show job candidates that you are committed to equal pay for equal work. (1) The study is based on 510,954 salary reports shared by employees in eight countries on Glassdoor from 1/1/16/-12/31/18. (2) Past research on the existence of a gender confidence gap in pay has been mixed. It has often focused on whether women and men are equally likely to ask for raises or promotions with some research finding that women are less likely to ask (Bosquet, Combes and García-Peñalosauet 2018; Leibbrandt and List 2012; Bowles et al. 2007; Babcock and Laschever 2003) and some research finding no difference (Artz, Goodall and Oswald 2018; Belliveau 2012; Gerhart and Rynes 1989). Glassdoor combines all the latest jobs with millions of reviews and insights to make it easy for people to find a job that is uniquely right for them. The company is on a mission to help people everywhere find a job and company they love. In pursuit of the mission, Glassdoor helps employers hire truly informed candidates at scale through effective recruiting solutions like job advertising and employer branding products. Launched in 2008, Glassdoor now has reviews and insights for more than 900,000 companies located in more than 190 countries. For more information, visit glassdoor.com.